October 2018 - Don Mills Builder, Inc. October 2018 - Don Mills Builder, Inc. The kids are back in school, the pools are closing up, and the nights are cooling off—just some of the telltale signs that fall is fast approaching. With the change of the season, it’s a good idea to do some home maintenance. Make sure your house is ready for colder weather by checking off the items on this checklist. Considering a new home? If you’ve ever thought about building a custom home, fall is a good time to get the process started. Spacious custom home lots in Greensboro are available now in some of the most desirable neighborhoods. When you choose your lot in the fall, you have time to design your home with your builder in the hopes of moving in by the following summer. HVAC Maintenance. At the very least, you should replace all of your HVAC filters before switching from air conditioning to heat. But even better, schedule a tune-up from a heating and cooling service. Also, remove any window AC units. Yard Maintenance. Of course, you’ve been mowing and weed eating all summer, but when was the last time you trimmed the bushes and cut back the trees? Tree maintenance is especially important before colder weather. Check all of the trees on your property carefully for dead branches and remove any you see, especially those that could land on your roof or your neighbor’s. If any trees appear to be dead, consider removing them entirely to prevent accidents. Trim back the live branches away from your roof and gutters. Seal and Insulate. Check weather stripping around doors and windows, seal any cracks or holes where air or pests could get in, and be sure all insulation is sufficient around water pipes and in the attic against the roof. These are good ways to avoid frozen pipes and ice dams on the roof in case of winter weather. Clean Gutters. Be sure all gutters are free of debris and all drain spouts deposit water far enough away from your home’s foundation. Clear out Dryer Vent. When lint builds up in the dryer vent it can be a serious fire hazard. Cleaning it out periodically is important, so make it a part of your fall home maintenance routine. Do Repairs Now. If there are some home repairs you’ve been meaning to get to, especially those on the exterior of your home, now is the time to get them done. Don’t put off exterior repairs until the weather becomes too cold to do them. Winter weather will only make matters worse, especially if the problem is a leak. If you think you’re ready to start the process of building a custom home, now is the time to get serious about it. There are lots of available custom home lots in Greensboro including lots in some of the most desirable neighborhoods, such as Birkhaven, Linville Ridge, Dawn Acres, Knight’s Landing, Jessup Ridge, and more. Call Don Mills Builders to inquire about current availability: (336) 362-1777. Location, Location, Location. Enjoy being walking distance to the popular Bur Mil Park. The park amenities are swimming pool, par 3 golf, lots of walking and biking trails as well as tennis. Located in N/NW Greensboro convenient to lots of shopping, dining and recreation. New Homes from the low $500’s. 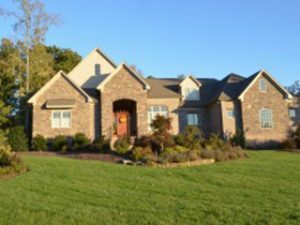 Are you planning to have a custom home built in the Greensboro area? There are many advantages to incorporating energy efficient features into your home design. You’ll save money on your monthly utility bills and you may even qualify for tax incentives when you make energy efficiency a priority. Your home will be more comfortable throughout the year. You’ll also reduce your carbon footprint, protecting the environment from the negative effects of modern living. When considering Greensboro custom homes, try some of these energy efficient home building ideas. High-Efficiency Heating and Cooling System. On average, about half of the energy usage in most homes comes from the HVAC system. Consider a high-efficiency furnace and air conditioning unit in your new custom home and you’ll experience years of lower energy bills. Appliances and Electronics. Refrigerators, washers and dryers, ranges, dishwashers, televisions, computers, and more all come in Energy Star and other energy-efficient brands. With homes being so overrun with technology these days, paying more up front for high-efficiency appliances will save you money in the long run. Lighting. There’s a reason many people refer to their energy bill as their “light bill.” Lighting is another big energy drain in your home. Design your home to let in plenty of natural light, including features such as large windows and skylights. The more natural light you incorporate, the fewer hours of the day you’ll need artificial lighting. And when you do need the lights, use energy efficient light bulbs such as LED bulbs. Insulation. When your home is properly insulated you’ll save even more energy because your heating and cooling system won’t have to work as hard to keep your home comfortable. Double-paned windows and weather stripping around doors also help to keep indoor air in and outdoor air out. On-Demand Water Heater. Wouldn’t it be nice if you never had to worry about running out of hot water? An on-demand water heater heats the water as it comes in on an as-needed basis. These water heaters are also referred to as “tankless” because they don’t heat water and hold it in an insulated tank until it is needed. Traditional water heaters waste energy keeping water warm so that it’s ready, whether you need it or not. Tankless water heaters are more expensive, but the convenience and energy savings are worth the cost. If saving energy is a priority for you, design and build your new home with Don Mills Custom Home Builders. Don Mills designs Greensboro custom homes with top rated energy-efficient features that will save you money. From high-efficiency appliances to natural lighting to excellent insulation, a Don Mills home will keep your costs low and your comfort level high. Call (336)362-1777 to start designing your energy-saving dream home.